Kindle DX – The Ultimate Reading Device? As mentioned in the previous post Amazon planned to announce their new Kindle yesterday and indeed they did. 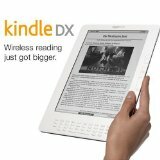 It is not the “Kindle 3” but the Kindle DX. I have included a video of the announcement by Jeff Bezos that was put up on Youtube. Nothing new really came out on the audiobook side. You can still buy audio books through Audible and transfer them to your Kindle DX and it still has the Text-to-Speech features for publishers that have approved it for their books. I believe the read aloud feature also works with your PDF documents which would be a great convenience as you go from reading to other activities where that isn’t practical. As a book lover and a technology lover I confess I have long looked for a device that does it all and reduces the clutter of newspapers, magazines and books that I have all over my house. The Kindle DX’s major upgrades to the Kindle 2 are the bigger 9.7″ display, the ability to ready PDFs and partnerships with some newspapers and some textbook publishers. The review audience if you see some of the feedback online is underwhelmed by this new addition to the Kindle family. The main concerns are that the display is still black and white and that the price point of $489 is prohibitive to really bringing this device mass market. Will it help the newspapers? I am not sure, some concerns were that subscriptions would only be subsidized for those areas that could not get home delivery of the paper. That does not seem like that big of an innovation or incentive for those of us who already have home delivery or those that already have a prior Kindle to buy this new expensive device. As for the text book application enhancements I would have to assume that their would either have to be some subsidies to get students to buy these or that the actual costs of the electronic textbooks would have to decrease significantly in order for it to make financial sense for students who are usually on a tight budget. The Kindle DX release seems a bit rushed but Amazon is trying to stay ahead of a bunch of competitors coming down the pike. You can preorder the Kindle DX on Amazon but they won’t be shipping until the summer. Is the Kindle DX the ultimate reading device? I would say at this point in time yes but as soon as someone comes out with a color screen all bets are off.